Can't afford a beach vacation this year? Don't worry. With easy breezy beach style decorating you can get all the ambiance of a day at the beach without setting foot outside the house. And the best news of all? It's an easy and versatile style that can be modified to suit any style of home. A sandy color palette with touches of blue is perfectly reminiscent of the sea and surf in this home by Butler Armsden Architects. To make the most of this type of palette try to stick with an open layout and limit the use of furniture and accessories. The idea here is to create an open, airy atmosphere, similar to what's happening just outside. A basic beach house living room is easy to achieve if you use the right combination of color and materials, like designer Sabrina Alfin did here. Soft blue paint, sand and stone colored fabrics and driftwood accents combine seamlessly to make an afternoon in this living room feel like a day at the beach. One of the best ways to get a beachy or coastal look is with shiplap, as seen here in this living room courtesy of Indian River Furniture. While some liken it more with farmhouse style, it's been historically more associated with nautical or "cape cod" style. The wide, horizontal planks evoke a sense of casual simplicity, and isn't that what beach style is all about? To make the connection from the outdoors to the indoors virtually seamless, consider a largely white color scheme with slim, streamlined furniture, like this beach house from Lissett Homes. In this beach house living room there's a sense of openness thanks to the large window and minimalist interior. Pops of sea blue help to maintain the beachy personality amidst all the white. Sometimes beach style is more about the feeling created than it is about the color palette. While the accent color in this beach style living room from Donna Elle is green rather than blue, it still has that easy breezy relaxed beach style thanks in part to the sandy off-white backdrop, scalloped edge furniture, coastal artwork, and shell details. 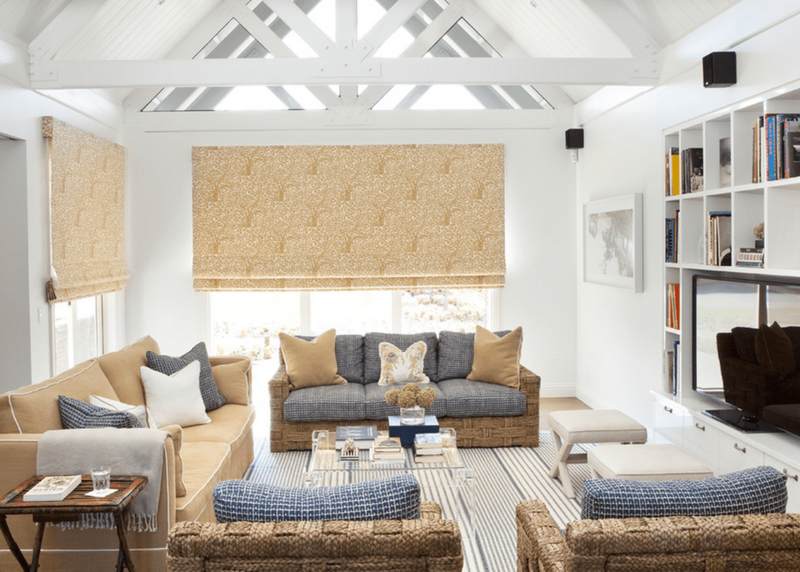 Leather couches and Persian rugs aren't often associated with beach style decorating, but this beach house living room, courtesy of Chosen Property Photography, proves that this style can't be pigeonholed. Despite the unexpected furnishings, the rough hewn floors and wicker chairs add a sense of casual beach flair. And notice the colors of the horizontal stripes on the walls - totally reminiscent of the beach horizon where the sand meets the water. While beach style is often considered easy and breezy, there's no reason why those who like their home to be a little more lavish can't partake. This beach house living room from Stephan Alexander Homes adds a little bit of glam to the relaxed style with mirrored coffee tables, delicate details and oodles of accessories. Just like the woman who wears jewelry and heels to the beach, this room considers the environment, but follows its own glamorous rules. Living on the beach is great, except for one problem—sand. It gets tracked inside and can be a huge pain to deal with. To make cleaning easier and reduce the amount of sand that gets caught up in fabrics, consider eliminating rugs and going solely with bare floors, like the owners of this property did. While rugs tend to add a certain cozy factor, in beachside residences you can often get away without them. Liven up a beach house living room with bright hits of coral. While beach style is often associated with the colors of the sand and sea, people tend to ignore what's going on under the surface of the water. Bright colors abound, and there's no reason not to include them in a beach style room. In this room, courtesy of Mathew Bolt, both patterns and colors are reminiscent of coral which livens up the space and adds an element of tropical fun. Beach style can differ very much depending on location. A tropical beach style is quite different than a northern beach style. The further north you go, the easier it is to incorporate shades of gray. This beach style living room from designer Carolyn Thayer speaks to the cool grays found in the Northeast—it's light and breezy during the day, and warm and cozy at night. Reinforce a beach style aesthetic with accessories. In this room from Spang Builders almost every single accessory, from the pieces of driftwood, to the painted seascapes, to the large boat sculpture, relate to the ocean in some way. When combined with the relaxed furniture and soft color palette, the result is 100% beach style. Contrary to popular belief, blue is not a necessary component of a beach house living room. Brown, beige and stone are more than sufficient for creating a feeling of coastal relaxation. The key is to include materials that are reminiscent of those washed up by the ocean - in the case of this room from Out In Design, driftwood. The rough wood lamps and the beach-inspired table they're sitting atop of really help to bring the beach theme home in this room. In any small space it's important to get creative with storage. Since beach activities often require a lot of accessories and equipment, it can be tricky to find room to store all of it. In this beach style living room from Starr Sanford Design, a surfboard is hung on the wall, making for a smart storage solution and a great beach house accessory. Cool, calm and collected defines this beach house living room from Echelon Interiors. Soothing tones mix pleasantly with driftwood and wicker accents, and classic architectural details to create an elegant but relaxed space. Try designing a beach house living room so that it feels enveloped by the sea and sand surrounding it. From color, to texture to pattern (or lack thereof), try to recreate the ambiance of the seaside so that the break between outdoor and in is minimal. In this room from Evergreen Homes the large windows are unencumbered by window treatments in order to maximize the connection with the outdoors. To say that the ocean is blue is a bit of an understatement. There are countless shades of blue in the sea, and therefore there can be countless shades of blue in an ocean-inspired living room. In this room from Studio 80 shades from navy all the way to aqua are incorporated, giving it not just beach style, but ocean style. Let a room's architecture speak for itself. The minimalist decor in this beach house living room from Pacific Edge Builders allows the beautiful ceiling details as well as the vertical lines of the floor and walls to stand out. The geometric lines of the furniture and accessories help to reinforce the clean and crisp look. A cool and crisp living room is a great juxtaposition to the heat and humidity of the beach. To create a look like this room from MRA Design start with a clean, white backdrop and then pepper in hits of strong blue. This works particularly well with a contemporary slant, so keep all the lines clean and the frills to a minimum. When it comes to sand and surf, most people focus on the surf. But sandy colors are great for creating a relaxed and friendly atmosphere. The real standout in this beach house living room from Diane Bergeron is the wide expanse of sand-colored fabric across the window. Not only does it help to enhance the beach theme, but it helps to draw attention to the striking architectural beams above. When you've got a large expanse of windows looking out over something so beautiful, don't detract from it by overdoing the interior design. While comfort is certainly key in this beach house living room from Martha's Vineyard Interior Design, there's nothing that immediately draws he eye and takes away from the view. It's all about casual comfort and the connection to the outdoors.